During Metro Manila Film Festival season, it has become a tradition for Filipino families to watch movies produced by Filipino movie production firms in order to get entertained and feel de-stressed after busily preparing for the holidays. Regal Films has been consistent in producing commercially successful horror films in the past several Metro Manila Film Festival editions. This time, they are returning to the horror genre with the movie Haunted Forest. The movie starts when Aris Guzman (Raymart Santiago) returns to his home province to investigate a peculiar case in which several young women were found lifeless and hanging on the branches of an enormous tree after having disappeared for a few days. His old friend (Joey Marquez) tells Aris that these young women were seized by a mysterious creature called "sitsit". The friend tells Aris to watch over his daughter Nica (Jane Oineza) because she might be the next to become the next prey of the sitsit. While in the province, Nica meets her cousin Mich (Maris Racal) and her two male friends RJ (Jameson Blake) and Andre (Jon Lucas). RJ and Nica would soon develop feelings for each other. There was nary a filler scene throughout the entire movie, and as the story progresses, the scenes get more intense than ever. Maris Racal is showing off her improved acting skills in the film as Mich, the concerned cousin. Her performance in the movie was impressive, in a surprising way. On the other hand, Jane Oineza once again proves that she is a brilliantly talented actress! She acts it all out during the scenes that her character feels weakened every time the "sitsit" comes after her. The love pairings in this movie had great chemistry too. Oineza and Jameson Blake show their amazing chemistry as a love pairing in the movie during the scenes that their characters spend time together, getting to know more about each other. Racal and Jon Lucas also have good chemistry, as childhood friends who could have romantic feelings for each other. Jerald Napoles is a revelation in this movie. The comedic actor can also pull off a portrayal of a madman just like what his character called for in the film. Betong Sumaya adds some comedic flavor as well, as the faith healer who attempts to heal Nica from the sitsit's spell. All in all, Haunted Forest may be a horror movie, but it can also tell a beautiful story on how family and friends should always be there for each other. It is truly worth watching, and it's best being watched with family members and/or friends as company. 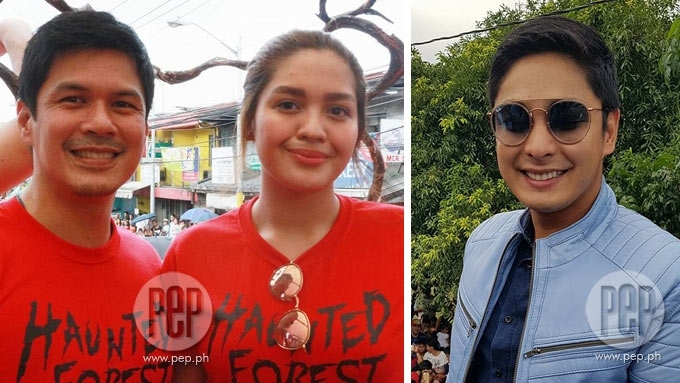 Raymart Santiago quips about Jane Oineza: "Anak ba kita? Parang pwede kitang girlfriend ha." Ang Panday actor-director Coco Martin (right) will visit cinemas in Metro Manila and in provinces. He promises, "Susulitin namin ang bayad niyo sa sinehan!" Raymart Santiago (left frame) plays the father of Jane Oineza in Haunted Forest. The 43rd edition of the Metro Manila Film Festival (MMFF) kicked off with the Parade of Stars that was held for the first time in Muntinlupa City. Raymart Santiago was one of the stars spotted at the star-studded event. How would he describe his character in Haunted Forest? "Yung character ko dito, parang sa totoong buhay. Father ako na very protective sa anak," he told PEP.ph (Philippine Entertainment Portal). "Mayroon akong asawa dito na namatay. "Gusto ko muna makalimot kaya nagpa-assign ako sa province. May conflict kami ng anak ko kasi millennial, wala masyadong signal sa probinsiya. Typical teenager-father relationship. In this horror film, Jane Oineza is cast as his daughter. How did they build up their relationship as father and child? "Day one pa lang, okay naman siya. Pero umpisa pa lang, [nagtanong ako], 'Anak ba kita? Parang pwede kitang girlfriend ha,'" recalled Raymart with a laugh. "Ang laking tao, e, paano tayo magiging mag-ama? Pero okay lang." Raymart revealed that in doing Haunted Forest, this is his first time to do a horror movie. The former action star admitted, "Hindi ako sanay. Sabi ko kay Direk [Ian Lorenos], 'Hindi ako marunong matakot, e. Pag natakot ako, susuntukin ko, e.' Ilang takes nga ako, e, nahihiya ako." Happy New Year! Let’s welcome 2018 with courage to face our fears! 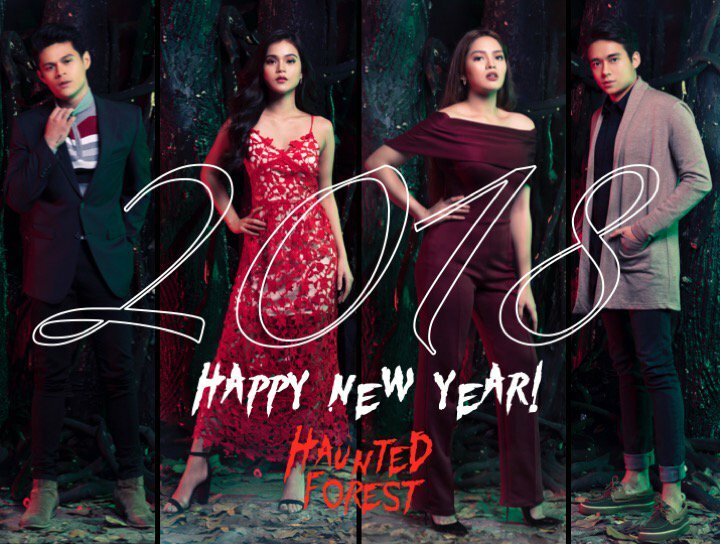 Love, Regal Entertainment Inc and Team Haunted Forest!